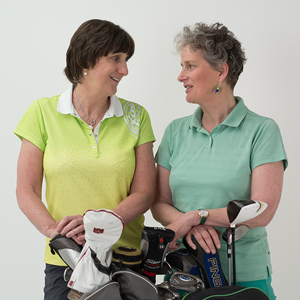 Madill Golf - Page 71 of 77 - Two Sisters. One Sport. One Passion. Want to putt like Henrik? Fred Albers is a sports broadcaster from Texas, who has been in golf for many years and knows the game from outside the ropes and in. He’s lived the ups and downs of a professional golfer’s life because his wife Kristi spent more than 20 years on the LPGA Tour and he was with her every step of the way. His insights are special and heartfelt. 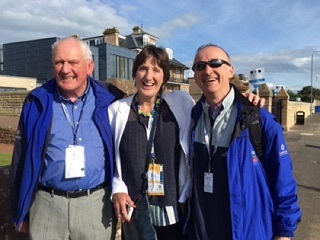 Maureen drove us up to Royal Troon on the Monday of Open week and we wondered how it would feel because neither of us was working in an official, accredited sense. 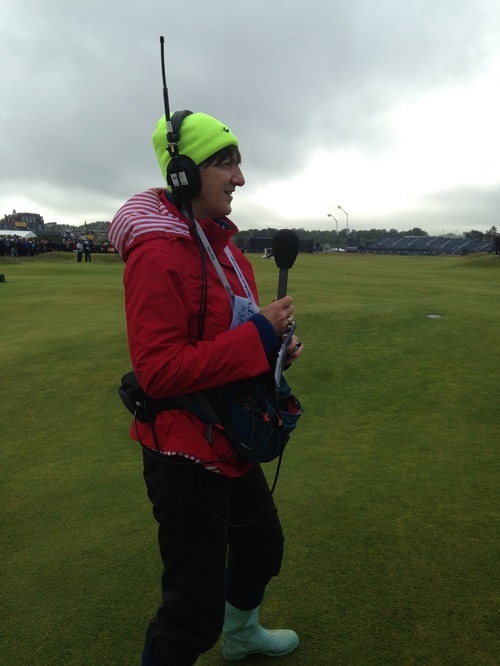 Blog stuff, which is of course a 24-hour-a-day pressure, is also a bit of a minefield for the R&A, who have had to accept that mobile phones are now an integral part of the human condition and only detached from the human body under general anaesthetic. There are little booths labelled ‘Digital Advisers’ scattered around the place at Troon and they are manned and womanned by mostly young patient helpful people who attempt to provide novices like me with a map to the magical mystery tour that is the Open app. Mind you, I was heartened to learn that they had to leave the booth to get a signal to connect to the wi-fi. Total control is totally impossible, hurrah. There are people with blue bibs proclaiming them ‘Official Social Media #The Open’ and they’re the ones allowed to do video stuff. There are signs warning the rest of us off video but it’s impossible, sorry, we can’t help it because even the photos move now. You take what you think is a happy snap, a still slice of life and whenever you have a wee look at it, to check the heads are in and there’s no thumb over the lens, the damned thing moves, like some portrait at Hogwarts. You can’t legislate for that. For some reason the video edict did my head in (a phrase that is nearly as irritating as ‘growing the game’ but as infuriatingly useful) more than the hideously dull, sanitised, expensive one-brand Open Shop (what’s open about a place devoted to a single company? ); more than the ridiculous notion that if you pay for your hideously expensive burger or your ice cream with a certain credit card, you’ll get a discount (paying for an ice cream with a credit card, it’s some sort of inflationary joke surely? ); and more than the stupid little wrist band (thank you for the song Paul Simon) you get if you go out the gate and want to come in again later, so you can’t pass your ticket on. Not very open. 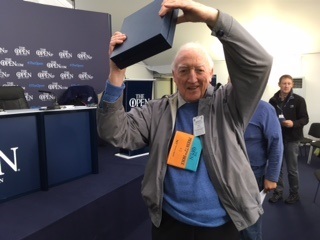 Jock MacVicar of the Scottish Daily Express celebrates another Open. His first was at Troon in 1962. I didn’t mean to rant but it’s because I still love the Open, because it’s still special and should always remain open, a little anarchic and unpredictable. There’s a thrill and a buzz like no other – that’s undoubtedly why Colin Montgomerie, first to tee off on his home turf at 0635 on Thursday morning, was nervous enough to take 6 at a wee hole he’s probably birdied more times than he’s had a meat pie. On Tuesday night, he was presented with an award at the AGW (Association of Golf Writers) dinner because covering golf was rarely dull with Monty about. 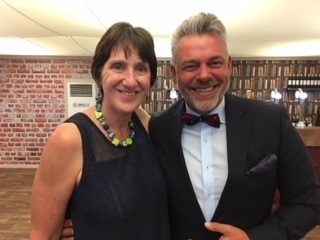 Rory McIlroy got an award; Diane Bailey ditto, as the last president of an independent LGU before its absorption into the R&A; Steve Willett, dad of Danny, said grace; Caroline and Padraig Harrington, Darren Clarke, Gary Player, Pierre Fulke, Peter McEvoy, Christian Hardin, Wilma Erskine and numerous other luminaries chatted and posed for photos, some of which turned out better than others. 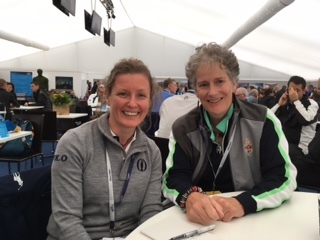 It was a celebration of golf and that’s what the Open is and why we keep coming back year after year, to catch up with friends and remember those no longer with us, put the world, golfing and otherwise, to rights and watch the best golfers in the world tackle the best courses in the world. It’s still magical. I’m frequently asked how I got into commentary and media work. It wasn’t ever anything I aspired to or had considered – it sort of, well, just happened. In the 1990s I was immersed in playing on the Ladies’ European Tour, consumed completely by trying to become the best player I could be. It was against this background, in the spring of 1997, that I received a phone call from Rob Nothman, then the golf producer on Radio Five Live and one of the best broadcasters there is, asking if I’d like to be part of the team to cover the Open that year at Troon. After checking that we had no tournament on that week (yes, I really did) I said “yes”. And so the door to a completely new and different world opened to me and that 1997 Open was the first of 20 consecutive Opens I covered for the BBC. I had never to my knowledge heard golf on the radio before but Rob sent through some cassettes (remember them?) of the Ryder Cup for me to listen to in order to give me an idea of how things worked. And there ended my training…..! I have to confess to being rather perplexed here because both holes, in my opinion, favoured the player coming in from the right. However, I held to my resolve to listen and learn. By the time I’d finished my questions both Alex and Ken had stopped walking and were staring at me with disbelief. Finally, Alex spoke. Clearly, I had a lot to learn. Over the next twenty years I have had the privilege of working with many great broadcasters including Tony Adamson, John Inverdale, Iain Carter, Gary Lineker, Matt Adams, John Maginnes, Brian Katrek and, of course, the incomparable Peter Alliss. 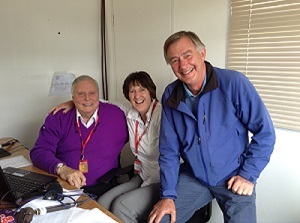 It was a big day for me the first time I was in the commentary box with Ken and Peter. This formidable duo were rostered on to take care of the first segment after lunch and I resolved to stay in the box, headphones off and learn as much as I could. Five minutes in, Alliss starts gesturing at me with his mike. After a little initial confusion it dawned on me he was actually bringing me in to the commentary. The great man believed I had something of value to add and I could feel my chest swelling with pride as I fumbled to get my headset on. A few minutes later I was distracted by a gentle rumbling sound from the corner. I looked over to see Peter, eyes closed, hands folded across his tummy, indulging in a small post lunch siesta. So much for my value! Ken and I carried on. And I never stopped learning. Always fun with Peter and Ken. Thanks for the lessons and the memories.